About two or three years ago I managed to persuade our network manager to set us up with Google Apps for Education (with the bribe that I would manage the accounts if he did the initial setup). Over the last two years we have successfully integrated the use of email across KS2 (in fact, today I have been inundated with emails from Year 3 who are just getting to grips with sending mail to class groups). As a school, most of the staff and children really appreciate the fact that you can send an email to someone which is safe and secure, in a closed network, but you can discuss something that you might not be confident enough to talk about in person. So far, we’ve only had two or three bullying issues and they were very quickly dealt with by the simple means of checking inboxes, outboxes and deleted items (it is amazing how terrifying it can be to a 9 year old to realise that a teacher can see their emails). We have also used google drive with varying success, which has proven to be popular with upper KS2, in particular the idea of having a multi-authored document goes down really well. So, this term we decided to try the new google classrooms setup, to coincide with a new BYOD (bring your own device) arrangement in Year 5. The school had made the decision to use myHomework as a way of communicating with parents as it allows simple communication between staff and anyone who signs up to the ‘class’, but we also decided not to share work via this platform since the children were taught in sets for maths and English and, since anyone can sign up to any class, we didn’t want them to be comparing work. This meant there wasn’t a simple way of distributing e-copies of homework except for by emailing them out and so, along with one of the literacy teachers, I decided to give Google Classrooms a go. 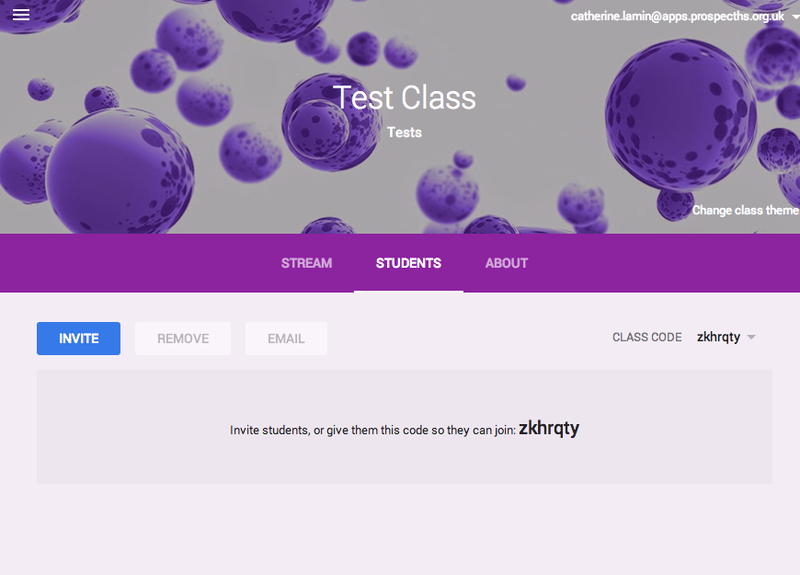 My first impression was that it was a nice looking interface – setting up classes was easy to do and you could only invite children from your own domain, which is a nice touch, but meant I couldn’t use my personal account as a test and instead had to create a test user in our Google Apps domain- no big deal of course, but useful to note. The next step was to populate the class, which can be done by searching through all of the users in the domain – I had already sorted all of the children into class ‘groups’ in the admin panel of google apps so I was disappointed not to be able to bulk import a whole class or group at a time, instead having to add them all individually. 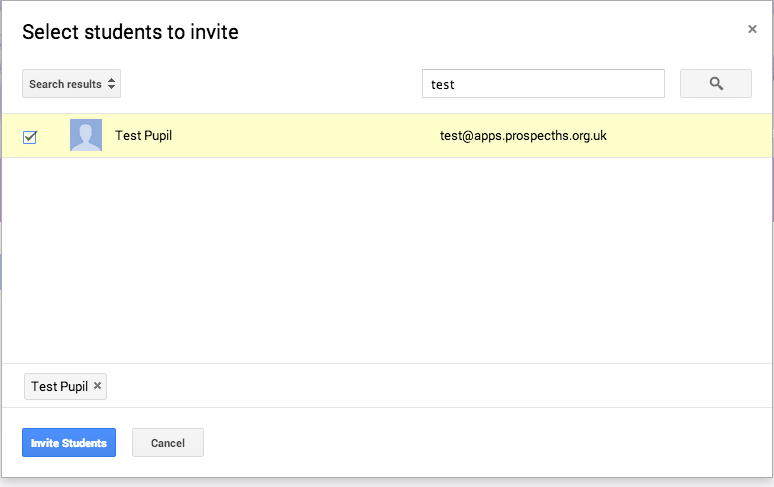 You will see from the above picture that until a child accepts their invite they are shown as ‘invited’ and greyed out so you can see if your class are members of the classroom or not. 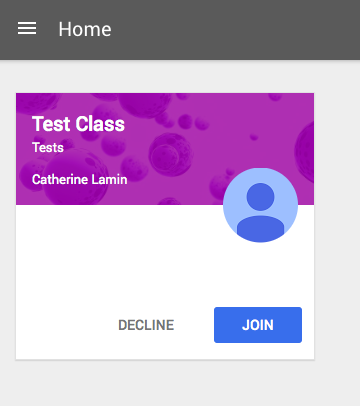 I assumed that each child would receive an email inviting to join the classroom, but that was not the case and instead I had to send them all a link to join Google Classrooms at which point they were informed that they could join my class – this seems a little roundabout and it would be a significant improvement if a link could be sent out as soon as a child is added to a class, without the need for them to separately log in to Google Classrooms. 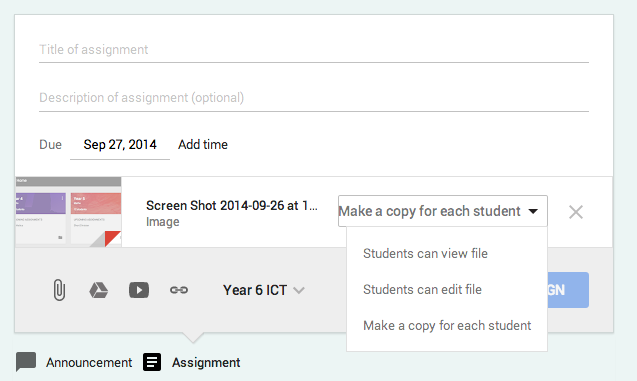 Which is a rather clever idea, especially as it is fully integrated with Google Drive. What it means is that in the teacher’s Drive, a folder is created called “Classroom” with sub folders for each class, when an assignment is uploaded it is placed in the appropriate folder. 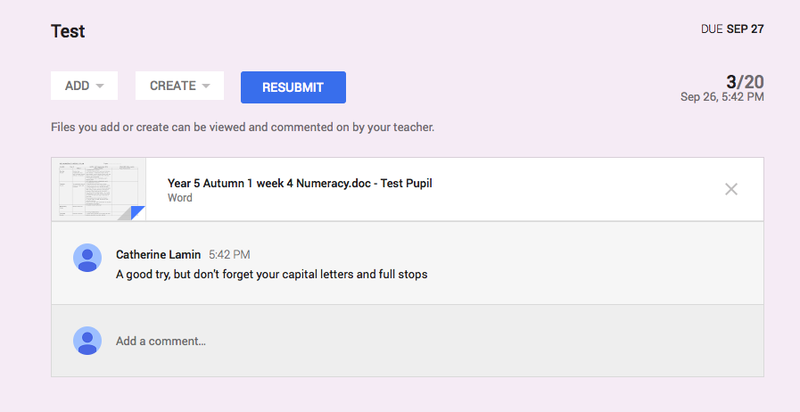 What is particularly nice about the ‘make a copy for each student’ option is that it creates a copy in the students Google Drive and when they submit it, you get a copy of their version in your drive with their name appended; THEN, even better, you can make some adjustments or highlight some changes or just add a few comments and then send it back to them for further corrections. You can also grade the paper or give it a mark out of whatever you choose before returning it. One of our literacy teachers used this to great effect as a starter for a lesson – he sent the children an un-punctuated piece of text, asked them to quickly alter it on their iPads and submit it to him there and then. He then sent it back with a few comments and adjustments and asked them to make these as homework. Instant, constructive feedback for him and for the children. So, when the teacher creates an assignment, the pupils get a message in their screen (one of my children described it as being a bit like Facebook for homework). The pupil then accesses the document, makes their changes and submits it to the teacher. The teacher can see on their live feed how many children have submitted their work or not. You will see in the third picture that the submitted file is in the teacher’s folder with their name both in the ‘created by’ column and on the end of the title of the document. 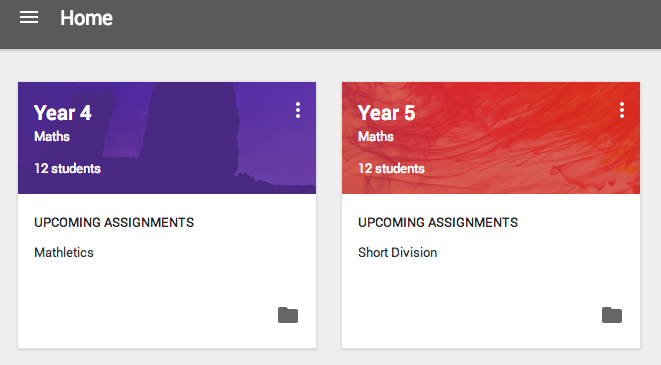 So, overall I am really impressed with Google Classrooms, it’s proven itself to be a useful classroom tool for a range of subjects – I could imagine it being used in literacy lessons and I know that one of our teachers has used it to do some Geography work using Google Sheets. The children really like using it because it is a bit like Facebook and they can write comments in the stream. It is also an attractive and free way to store e-copies of worksheets so that you can eliminate the classic homework excuse “I left my homework in my desk” and, more importantly, I really love the integration with drive that means that work is effortlessly stored and saved. Considering the ease of use and the fact that so many schools already use Google Apps for Education instead of a VLE, this project is a natural progression and I would definitely recommend using it.